My dear grandmother passed away two years ago, with her husband, Ed, sitting solemnly by the side of her hospital bed. She was always kind, friendly, but also very intelligent and unusual - and Ed has since gifted me something that she gave him on her thirtieth birthday. Happy birthday to me, Ed! I hope you know what I want as a present. Just in case you don't remember what I asked for, here's a puzzle to remind you. 2. Solve the edgeless puzzle. Edge to edge connections should be formed by triples, please. No more, no less! 3. Look at numbers, for squares are important. 5. Solve the final rebus. 6. Buy me that present! Shown above are the 9 rebus cards. Ed told me that he never solved the puzzle, but he had remembered what Grandma asked for, and gave her the present she wanted. He wanted me to look at these cards to see if I could solve the puzzle as intended. I worked on it for a day or two, and promptly told Ed what he bought for Grandma's thirtieth birthday. Can you work it out, too? EDIT: Thanks to Deusovi and Rubio for suggesting an improvement to the rebus with a pencil! 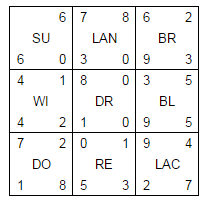 We can arrange the pieces into a 3×3 grid so that each pair of adjacent words has a three-letter string in common. In the middle, diamonds are formed with the triangles in each corner of the original tiles. Reading across the middles, we see the numbers 03 09 / 18 03 // 21 09 / 20 19, which can be decoded with A1Z26 to get CIRCUITS. So we have the word "circuits", written inside diamond-shaped sections. Grandma must've wanted diamond rings! With the recent slew of enjoyable rebus puzzles hitting PSE, I decided to bandwagon a little and make some rebuses of my own. Now, I typically like to make puzzles with several layers - it's more fun to design, and hopefully more fun to solve! So I wondered how I could turn rebuses into a multi-layered puzzle. Interestingly enough, the first rebus puzzle that I sketched out was the one that caused the most quibbles. 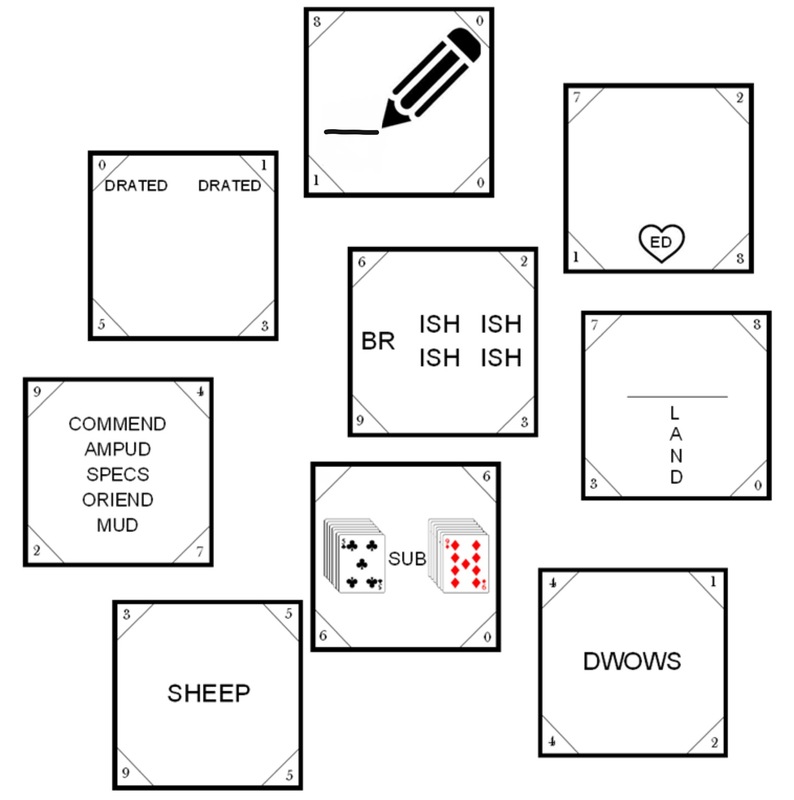 'DRAWING A BLANK' was initially represented with a square in place of the underscore that is present in the final version of the puzzle, and I intended it to look like a blank rebus card. That's since been changed, but anyhow, this was the first rebus answer I made. I wanted the next step after the rebus solving to be somewhat unusual. Thinking about the fact that rebuses are almost always presented in fairly minimalist squares, I thought that maybe, just maybe, I could somehow get the answers to clue a grid arrangement of the rebuses! What is in a word? Not much, really. There's their meaning, and then there's their construction. Since rebus answers tend to be quite specific and unusual things, using meaning to join rebuses seemed unlikely. Then I noticed 'in' inside DRAWING A BLANK. 'In' is one of the most common rebus strings. All of a sudden, it hit me that I could use strings of letters in common to join the rebuses! 2 letter strings seemed kinda silly, and 4 seemed way too tricky. So, it was basically decided that it was going to be 3. Since DRAWING A BLANK is a fairly long rebus answer, I just set it to be the middle of a 3x3 square (most neighbours) and decided to build the rest off that. I ended up using a LOT of scrabble word finder. Suffice to say, it was a difficult process for me to get phrases/words that not only joined by three letter strings and had a unique solution, but also to be phrases/words that could be nice rebuses. You might notice, now, that 3 of the corner pieces are obscure in comparison to the rest: 'brandishes', 'subindex', and 'lactate', simply because I did the corners last and basically relied on testing combinations of 3 letter strings to find words that could be rebuses. Now, I'm sure that with a bit of foresight and possibly an entirely different set of rebuses, something magical could've happened after the arrangement step (don't ask me what, but I'm sure someone more creative than me could make something super cool happen). However, I decided it'd be too much effort to make something super elegant! So, I simply decided to have the arrangement give the solver attention to some useful information out of a LOT of extraneous information. It kind of made sense to stash this information in the corners of the rebus pieces, which would've given 16 pieces of important information near the center of the arrangement. Should they be letters? Nah, I thought. Numbers? Sure, but why? Alphanumeric conversion. Heh, alright. 16 numbers would give 8 letters through alphanumeric substitution. Initially, this was going to say a rather bland 'well done'. However, thinking about the fact that this is a rebus-themed puzzle, I wondered if somehow this last step could become another puzzle in itself. Noting the diamond shapes, 'DIAMOND RING' jumped out at me. Unfortunately, I couldn't find an 8 letter synonym of ring... oh but hey, a 7 letter one will work with pluralization! Thanks to the kind and observant folks here at PSE (Thanks @Deusovi and @Rubio in particular) I made a few edits to this puzzle as it was being solved in order to make it fairer/nicer. In fact, when initially posted, I forgot to erase that corner of the cards rebus - which would've led to an astonishing 8 assemblies of the pieces! Rubbing of one corner didn't give too much away, but reduced this number to 2. Step 2, being the most complicated step, turned out to be a bit more handwavy than anticipated, with some puzzlers discounting the correct route due to the 'DOW' string occurring three times, along with 'DOWN' occurring twice. So I felt it was needed for the wording to be highly unambiguous in this step - it's still a very puzzling step, even when 'edge to edge connections' is specified, and 'no more, no less' was simply a note to not get distracted by that pesky 4 letter string. Well, this was a fun puzzle to make, and hopefully, it was a fun puzzle to solve! I enjoy making multi-layered puzzles, and I'd like to think that there's a nice sense of discovery to them during the solving process. I really hope you enjoyed solving - hang on a second! You haven't done step 6 yet! You haven't really COMPLETELY followed Grandma's instructions. Puzzle impurist! If you want to call yourself a true puzzler, finish what you started! PM me for a mailing address :) I await my diamond rings! Not the answer you're looking for? Browse other questions tagged wordplay rebus jigsaw-puzzle or ask your own question.